Travel to Germany with YCA! Join us for eight unforgettable days of seaside beauty, urban excitement, and great concerts! On this unique custom trip created by Young Concert Artists just for our friends, begin with four glorious days on the unspoiled Baltic Sea island of Usedom, combining the natural beauty of this peaceful resort island with magnificent music at the 25th Usedom Music Festival, including performances by three YCA artists: pianist Nathan Lee, violinist SooBeen Lee, and accordionist Hanzhi Wang. Enjoy leisurely days on the dune-backed beaches combined with world class performances in historic venues. Usedom Island – virtually unknown to Americans – is the second largest island in the Baltic Sea and known as the “sunny island.” The island boasts 25 miles of sandy beach (the longest in Europe) and a string of Imperial Spa towns where we stay, and features a distinctive style of architecture. Then spend four days in Berlin, one of the world’s most exciting and eclectic cities. Berlin offers an unparalleled combination of vibrant culture, museums, cutting-edge architecture, fabulous food, and fascinating history. Take in Berlin’s iconic sights from the Brandenburg Gate and Reichstag to Museum Island and Frederick the Great’s Sanssouci pal ace. Hear the Berlin Philharmonic in their striking home, and exclusive private concerts by YCA artists: pianists Benjamin Moser and Dasol Kim, and violinist Viviane Hagner. Stay in Berlin’s finest hotel, cruise the River Spree by private yacht, and savor gourmet meals by Michelin-starred chefs – you’ll experience Berlin as an insider. Arrive Berlin and check into Hotel Adlon Kempinski Berlin. Afternoon and evening at leisure. Depart Berlin for Usedom Island by private transport to our hotel in Ahlbeck (approximately 3 hours). Check into the luxurious Romantik Seetelhotel Ahlbeckerhof, facing the beautiful Baltic Sea. Enjoy the tranquil atmosphere of this turn-of-the-century resort town of sand dunes and sparkling sea. Stroll the boardwalks, relax in a covered beach chair, and enjoy the sea air. 5:30 pm Early Dinner in the hotel in order to depart at 7 pm for those wishing to attend the Festival Opening Concert at 8 pm, approximately 45 minutes away. 8 pm: Opening Concert of the 25th Anniversary Usedom Music Festival in an historic power plant in the village of Pennemünde, featuring the Baltic Sea Philharmonic conducted by Kristjan Järvi. The program entitled “Nordic Pulse” includes works by Sibelius and contemporary Nordic composers, followed by a reception with the artists. Enjoy the morning and lunch at leisure. 3:00 pm Concert by accordionist Hanzhi Wang, 2017 Winner of the Young Concert Artists International Auditions, in the historic 15th-Century St. John’s Church in the village of Zichow. Having astonished the YCA Jury with her stage presence and brilliant mastery on, of all instruments, the accordion, she is poised to redefine repertoire from Bach to Piazzolla. 5:30 pm An early dinner with Thomas Hummel, Director of the Usedom Music Festival at the fish restaurant “Zur Alten Fischräucherei” in the village of Rankwitz. Day tour of Usedom Island by private bus including lunch. Sight-seeing highlights include several historic churches and a castle. 7:30 pm Dinner in the gourmet restaurant “Blauer Salon” in the hotel. Morning boat ride on the Baltic Sea (weather permitting) and a visit to the Pennemünde Historical Technical Museum (the “rocket museum”), the birthplace of modern rockets. Lunch and afternoon at leisure. 7:30 pm Concert by pianist Nathan Lee, 2015 Young Concert Artists International Auditions Winner, in the Hotel Esplanade in Ahlbeck. Just 15 years old when he won the YCA Auditions, Nathan Lee has already wowed audiences from the Seattle Symphony to the Orquesta Filarmónica del Boca del Rio in Mexico and at Carnegie Hall’s Zankel Hall. 9:30 pm Dinner with Nathan Lee at “Kaiserblick” Restaurant in the hotel. 10 am: Drive by private motor coach to Berlin (2 ½-3 hours). Check into the Hotel Adlon Kempinski, in the heart of Berlin on Pariserplatz, across from the famed Brandenburg Gate. Berlin’s finest hotel pre-1945, it has been recreated in its original location and remains the city’s grandest. Lunch at Restaurant Quarré in the hotel, followed by a walking tour including the Reichstag, the haunting Holocaust Memorial by Peter Eisenman, and along Unter den Linden, the “Champs-Elysées” of Berlin. 6 pm: We are guests of distinguished YCA alumnus pianist Benjamin Moser for a private performance in his home. Laureate of the International Tchaikovsky Competition and Artur Schnabel Piano Competition, Benjamin Moser plays throughout the US and Europe, from the Munich Symphony Orchestra to the London Philharmonic. “Berlin Welcome Dinner” at the home of Dr. Magda Gohar-Chrobog, Young Concert Artists of Washington Board member, and Jürgen Chrobog, former German Ambassador to the United States and Deputy Foreign Minister of Germany. City sightseeing tour by private motor coach, including the Berlin Wall Memorial, Checkpoint Charlie, Alexanderplatz TV Tower, Gendarmenmarkt, and the Hackesche Höfe’s courtyard shops. Lunch at the historic Cafe Einstein, a classic Viennese coffee house renowned for its Wiener Schnitzel and Apfelstrudel. Visit Museum Island’s Pergamon Museum with its 2nd century Roman Market Gate of Miletus, and 6th Century BC Ishtar Gate and Processional Way of Babylonian King Nebuchadnezzar II; and the Neues Museum of Egyptian treasures including the famous bust of Nefertiti. Visit the lavish Berlin Cathedral, and see the Hohenzollern Royal Palace being reconstructed. 8 pm: Concert by the Berlin Philharmonic in their acoustically renowned home, the Philharmonie. The program, conducted by Semyon Bychkov, includes Dvořák’s Symphony No. 7 in D minor, Bruch’s Concerto for Two Pianos and Orchestra with pianists Katia and Marielle Labèque, and Detlev Glanert’s Weites Land for orchestra. Dinner before or after the concert in the hotel as you wish. 10 am: See the city from a different perspective on a Spree River cruise on the private yacht “Aida” (weather permitting). Lunch at the Roof Garden restaurant atop the Reichstag, followed by a tour of the dramatic glass dome in this history-laden building, strikingly rebuilt by Sir Norman Foster for use once again by the German Parliament. Tour of the Boros Sammlung of contemporary art, a private collection housed in a converted WWII bunker. 6 pm: Enjoy a private performance at Steinway & Sons, Berlin, by YCA pianist Dasol Kim and YCA alumna violinist Viviane Hagner. Currently garnering attention for his ongoing performance of the complete Beethoven Sonatas in Korea and Switzerland, Dasol Kim plays with major orchestras around Europe. Viviane Hagner is a regular soloist with leading orchestras worldwide since the age of 13, when she performed in the historic “Joint Concert” in Tel Aviv with the Berlin and Israel Philharmonic Orchestras. Dinner at the 2-Michelin-starred restaurant Lorenz Adlon Esszimmer with the artists! Day-trip with private bus and guide to Potsdam to see the exquisite UNESCO World Heritage Site “Palaces and Parks of Potsdam.” Tour the 18th century royal palace and gardens “Sanssouci,” the Rococo summer palace of Frederick the Great, King of Prussia. Lunch at the lovely Italian restaurant Villa Haacke in Potsdam. After lunch, visit Glienicke Palace and Park, designed by Karl Friedrich Schinkel for Prince Carl of Prussia in the early 19th-century, and nearby Glienicke Bridge, the infamous “Bridge of Spies” where, during the Cold War, captured spies were exchanged on this border between East and West Germany and made into the movie of the same name starring Tom Hanks. Returning to Berlin, optional visit to the Museum Berggruen, a fabulous collection of modernist masters including Klee, Picasso, Braque, Matisse, and Giacometti, interwoven with African sculptures, assembled by art dealer Heinz Berggruen and bequeathed to the city. Cap off our trip with a celebratory Dinner at “Sra Bua by Tim Raue” in the Adlon Hotel. This pan-Asian restaurant combines Asian flavors with the culinary signature of Germany’s celebrated star chef, Tim Raue. Breakfast at the hotel. Private transfer to Berlin airport provided for your departing flight. 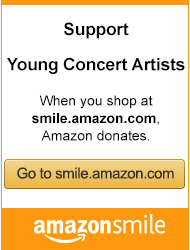 Included in the tour cost is a tax-deductible contribution to Young Concert Artists, Inc. of $1,500 per person. You will receive a tax-deduction receipt for your gift. Four nights in a Sea-view or Side Sea-view Suite in the 5-star Romantik Seetelhotel Ahlbeckerhof, in the historic spa town of Heringsdorf on Usedom Island. Hosting Kaisers and Kings since 1890, the flagship hotel of the luxury Seetelhotels offers an imperial experience in architecture and ambiance. Five nights in a Deluxe Room at the 5-star Hotel Adlon Kempinski Berlin. The legendary original Hotel Adlon, opened in 1907, was one of the most famous hotels in Europe. The current hotel, opened in 1997, offers luxurious accommodation, extensive spa services, three restaurants, and the premiere location in Berlin. Transfer between Berlin airport and Hotel Adlon Kempinski Berlin upon arrival and departure; private transportation between Berlin and Usedom. Private transport to and from events and dinners as needed, and private transport to/from Potsdam. A knowledgeable English-speaking guide will accompany us when touring. Young Concert Artists will also provide assistance throughout the week. Personal costs including telephone calls and personal services such as: travel; room service, laundry, and valet service; mini-bar items and à la carte orders. If due to weather, flight schedule changes, or other uncontrollable factors, additional hotel nights are required, patrons are responsible for their additional hotel, transfers, and meal costs. Trip Cancellation/Interruption Insurance is not included, but recommended. Events, activities, programs and artists may be subject to change. Young Concert Artists, Inc. (“YCA”) reserves the right to cancel the tour prior to departure for any reason including insufficient numbers of participants, as well as the right to decline to accept or retain any person as a member of the tour at any time. If YCA cancels the tour prior to departure, participants will receive a full refund of any monies paid to YCA. If bookings fall below the minimum required, participants will be advised of itinerary alterations or trip cancellation no later than June 29, 2018. Cancellations by participants must be received in writing by YCA, and charges are calculated as of the day notification is received in writing by YCA. If a participant cancels, the following scale of charges is incurred: For written cancellation received by YCA by June 22, 2018 or before, $300 cancellation fee per person; from June 23 through July 20, 2018: $750 cancellation fee per person. Cancellations received from July 21 through August 24, 2018 result in forfeit of $1,500 per person; and cancellations received from August 25 through September 21, 2018 result in forfeit of $2,500 per person. After the tour has commenced, it is not possible to issue any refunds. No refunds are given for any unused portion of the tour including, but not limited to, missed meals or other events. A package of cancellation, baggage, and medical insurance is recommended. A $1,000 per person deposit is required to confirm a space for the trip. The balance is due in full by July 13, 2018. Deposit and balance payments are preferred by check to Young Concert Artists, Inc. or wire transfer. If you wish to pay by credit card, there will be a 3 % surcharge. Young Concert Artists, Inc. (“YCA”) acts as the agent for the suppliers of services (including, but not limited to, ground transportation, meals, and lodging) provided in conjunction with the tour. YCA is not liable for the negligent acts, omissions, defaults, or failure to perform of suppliers. The Participant releases YCA from any and all liability resulting from acts or omissions of the suppliers of services, including, but not limited to, loss, damage, delay or injury, or damage to Participant (including death) or personal property. YCA is not liable for losses or delays arising from sickness, quarantine, government restraints, war, acts of terrorism, weather conditions, earthquakes, or acts of God. In no event shall YCA’s liability exceed the amount received by YCA from Participant. YCA has no special knowledge of hazards regarding health or safety in the destinations visited by Participant. Participant agrees to assume full responsibility for his/her safety. Participant assumes all risks of damage or injury in connection with any risks and agrees to indemnify and hold harmless YCA against any and all claims arising from Participant’s travel to such destinations. Dates, schedules, program details, and costs stated by YCA’s itinerary and brochure are given in good faith and based on information available at the time of publication of the brochure and of pricing the tour and are subject to change and revision at any time by YCA. YCA does not guarantee the rates of any suppliers and reserves the right to substitute alternate suppliers if deemed necessary by YCA. YCA reserves the right to change Participant’s itinerary if, in YCA’s sole discretion, such change is advisable to protect Participant’s safety. No refund shall be due from YCA in conjunction with changes in rates or itineraries, substitution of suppliers, or Participant’s decision not to complete a tour itinerary. YCA reserves the right to refuse to accept any Participant, cancel any tour at any time, or request a Participant to withdraw from a tour if, in YCA’s sole discretion, such refusal, cancellation, and/or withdrawal are in the best interest of Participant or other tour Participants. Participants are encouraged not to purchase airline tickets until after receiving a letter stating that they are confirmed on the tour, and YCA does not accept liability for any airline cancellation penalty incurred by the purchase of a non-refundable ticket to the tour departure cities and return. Baggage and personal effects are the sole responsibility of the owners at all times.